I read…way too many books. Far too many for someone in graduate school. Far, far too many to write up detailed reviews for each one. But, since I do read so many books, and since readers advisory is one of those things the Internet was practically made for, I thought I’d institute a Book of the Month feature, where I highlight a book I read in the past month. I can’t promise they’ll all be new, and I can’t promise they’ll all be good, but I can certainly promise I will always have read at least one interesting book in a month. This book is both new and good! Excellent, we’re off to a great start. Also, I love science fiction and fantasy in all forms. This will become apparent very soon, if it hasn’t already. The series is planned to include one book for each of the seventeen Dragaeran Houses, plus two additional, including one that has already been published. In publication order, then, these are: Jhereg, Yendi, Teckla, Taltos (not a House), Phoenix, Athyra, Orca, Dragon, Issola, Dzur, Jhegaala, and Iorich. Each House has a particular defining characteristic, and this characteristic becomes the main theme for the book: Orca are merchants and businessmen, so the theme of Orca is economics; Dragons are generals, so Dragon is about a war. And so on. (Forthcoming: Tiassa, Lyorn, Hawk, Tsalmoth, Vallista, Chreotha, and a final book which may or may not be called The Last Contract. Fans spend a great deal of time trying to figure out just what the characteristics of these Houses are and thus what the plots of these books may entail.) There’s a depth of understanding in these books that also sets them apart from cookie-cutter fantasy, as Vlad comes to more fully understand the world he lives in and works to change himself. The character development can be subtle, since publication order is not the same as in-universe chronological order, but it’s immensely satisfying. Finally: Iorich. Iorich stands for law and justice, and the House of Iorich serve as Justicers (judges) and advocates. In this book, one of Vlad’s old friends is arrested for the practice of Elder Sorcery, and he takes it upon himself to start up the legal proceedings. He hires Perisil, a tedious but extremely efficient Iorich, to deal with the official matters while Vlad talks to pretty much everyone he knows trying to understand why Aliera was arrested for something everyone knew she’d been doing for years. In between the arguments, secret meetings, and assassination attempts, the theme of the book is really justice — whether it’s possible to get any, and what it would mean if you did. Like all the hard questions, this one has no easy answers. 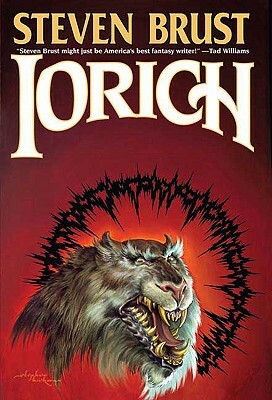 I loved Iorich, but I’m not positive it’d be the best place to start if you’re just getting into the series. If you’re into this kind of modern-language high-concept fantasy, it certainly wouldn’t be a bad place to start, either — particularly if you’re aware that at least half of the “but that’s another story” references are still obscure even if you’ve read all the other books in the series. This is a big universe, and Brust certainly hasn’t told all the stories in it yet. For a gentler introduction, I’d suggest Jhereg, Taltos, or Dragon (although if you’re a fan of noir mysteries, Jhegaala has a lot of in-jokes for you). Once you’ve gotten through all those, and if you take to it anything like I do, that will only be a week or so, Brust’s other Dragaera books are Brokedown Palace, an Easterner story in the mode of a Hungarian fairy tale, and the Paarfi series, starting with The Phoenix Guards, which is a high-fantasy pastiche of The Three Musketeers. The Lyorn Records, a fan-run wiki attempting to organize all the Dragaera information we have. Contains book summaries with spoilers. The Dream Cafe, Steven Brust’s website, and Words, Words, Words, his blog. The other day I posted about Amazon’s snit-fit, pulling all Macmillan titles from their store during an argument over ebook pricing. I also posted that Amazon had capitulated, agreeing that they would have to go along with Macmillan’s pricing plans. I think it’s also worth pointing out that, as of this writing, Amazon still hasn’t returned Macmillan titles to its store. You the consumer still can’t buy the books from them. The authors whose books have been pulled are losing sales figures, which is going to impact both their royalties and their contracts for new books. I agree with John Scalzi on this: while I can understand if not condone pulling titles as a negotiation tactic, keeping them pulled at this point is just petty, and is (or at least should) do Amazon more damage than good in the long run. And if you have a favorite author published by a Macmillan press, consider buying one of their books from somewhere else to help them out.